My mother recently celebrated a big milestone birthday. Several of us in my generation made appetizers to pass around at the birthday party with the extended family. My mother and the rest of my family has always loved my pesto, so it should have been no surprise that the pesto crostini I made were snatched up very quickly. So I thought this Classic Basil Pesto Crostini would be a natural to share for this #SundaySupper featuring favorite recipes for Mother’s Day. Pesto is pretty simple to make, so I’ve yet to figure out exactly what makes mine seem to stand out for people. Maybe it’s because I make sure to have plenty of garlic in mine, or the way I meticulously pluck those basil leaves and leave behind any that don’t look great. I also like to use Pecorino Romano cheese, which imparts a nice flavor. Perhaps some people buy that store bought pesto, which can’t compete with pesto made that day. 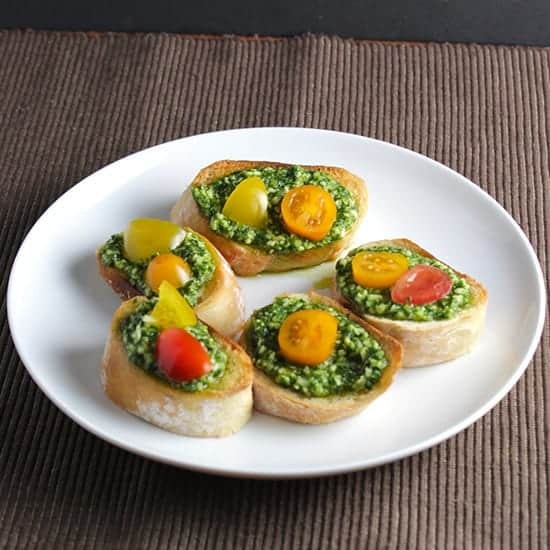 To make these pesto crostini for a crowd, I get the pesto ready earlier in the day, and get the bread all sliced up in advance, too. Slicing the bread fairly thin allows for a good pesto to bread ratio. Then at the party I quickly toast the bread and spread the pesto, and boom, it’s ready to go. And I mean go fast off the plate! You can make these crostini without the tomato topping, but my mother loves good fresh tomatoes. When tomatoes are at their peak in August, she loves to have a simple tomato sandwich for lunch. The tomatoes also add a nice touch to the presentation. I got a packet of small multicolored heirloom tomatoes, which looked great on the platter. Wine Pairing: Sauvignon Blanc is the classic pairing for pesto; I described some of the reasons for that when I served up my pesto recipe with wine pairing. You can go with other crisp white wines, too. I like to serve pesto with a Picpoul de Pinet, for instance. When serving the pesto along with other apps, sparkling wine can also be a nice choice. Fresh homemade pesto spread on crispy crostini, topped with some tomatoes, for an easy and tasty appetizer. Pre-heat an oven to 400. Spread the bread out in a single layer on a baking sheet or large piece of aluminum foil. You will likely need two sheets.Use the oil spray to coat one side of each slice of bread. Remove the toasted crostini from the oven, and spread a dollop of the kale pesto to coat one side of each piece of bread. Place on a serving platter, topped with the tomatoes, and enjoy! Be sure to check out all these tasty #SundaySupper recipes! A wonderful appetizer for Mother’s Day and any celebration. Topped with fresh summer tomatoes is the bomb! This is the type of appetizer that never disappoints! Your thick layer of pesto makes them extra scrumptious! Often the simplest recipes are the most successful. I don’t understand why anyone would be pesto when it is so quick and easy to prepare yourself. Thanks for sharing David. What beautiful appetizers, David! I can see why they disappeared quickly. Fresh pesto is the best and the care you put into choosing the best ingredients must be evident in the taste! So pretty and I would have those munched down in no time, YUM!! What a great appetizer – always such a crowd pleaser!! There’s something so fresh and wonderful about pesto. Your recipe looks perfect and ideal for a celebration! This is one of the most beautiful crostini presentations I’ve ever seen! It’s mouthwatering! I agree the fresh tomatoes only makes these crostini better! This is a great appetizer recipe!! thanks! 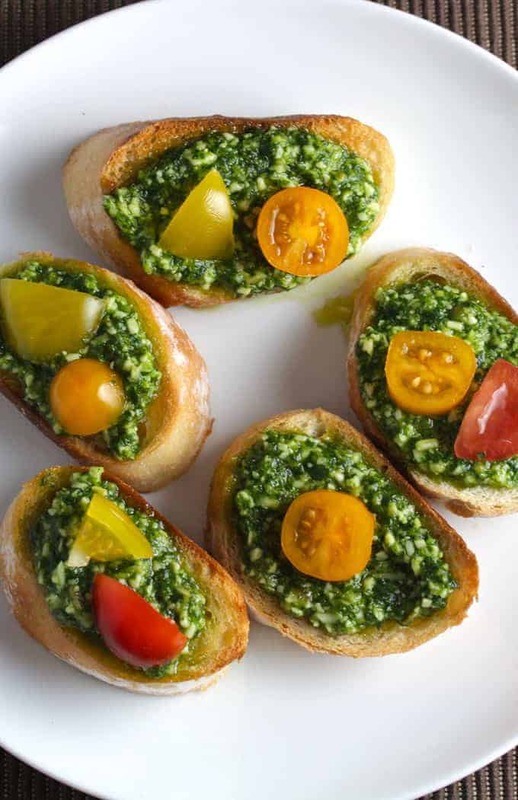 I love pesto and these appetizers look wonderfully delicious! I’ll have to tell you a funny story about my pesto. I will definitely have to make this! My little one and I LOVE pesto. I love that your pesto is cheesy! The cheesier, the better! Fresh pesto wins any day. I love this idea for a simple appetizer. 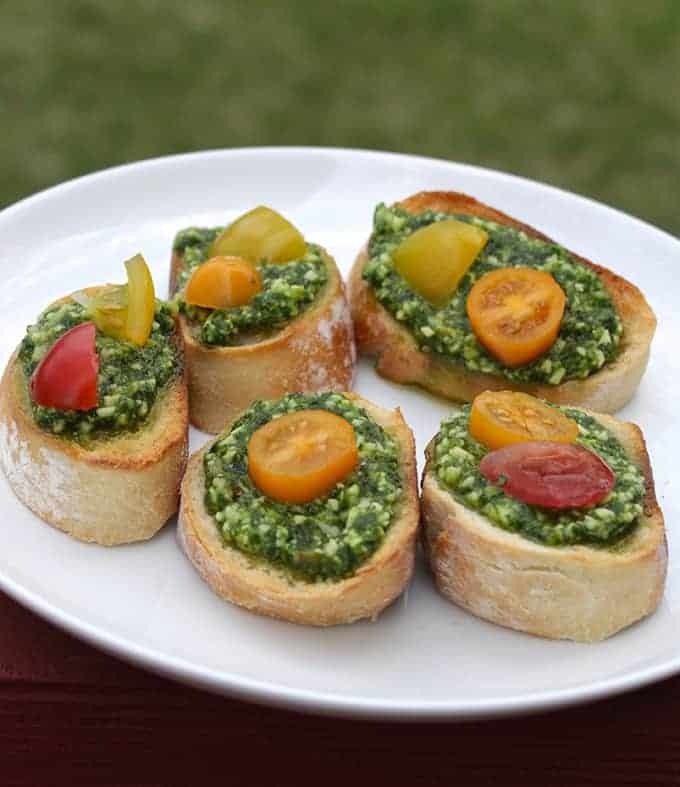 Spreading the pesto over crostini makes it a perfect finger food and super easy for a crowd! These are beautiful! What a great, easy appetizer! You had me at pesto! What a delicious appetizer and so easy too! Thanks Sarah, it’s yet another good use for pesto! The basil really brought out the flavors! Thanks for stopping by! Don’t question what makes your pesto better than any other, just own it! 🙂 A big happy birthday and happy Mother’s Day to your Mom! Such a savory, colorful appetizer for summer entertaining – well done!